Peter Pan overlooks Captain Hook in United Kingdom pavilion topiaries.Nikon D750/16-35VR, 1/125s, f/16, ISO 220, EV 0, 22mm Focal Length. I ask you, what could be more Spring than the topiaries seen during Epcot’s Annual Flower and Garden Festival? All of Disney’s favorite characters literally spring to life in carefully groomed trees, shrubs and subshrubs … Continue reading "Disney Pic of the Week: Spring"
The aerial subject this week is Epcot. I am recycling an image I took during Epcot’s 30th Anniversary celebration which still represented much of what I remember seeing when I first visited 29 years prior. Future World from the monorail over Epcot.Nikon D700/Tokina 11-16mm, 1/125, f/16, ISO 200, EV -0.6, 16mm focal length. Deb will … Continue reading "Disney Pic of the Week: Epcot Aerial"
Today is my birthday and I am going to indudge myself with photographic candy. Late afternon at Disney’s Hollywood Studios means the Sun is behind The Great Movie Ride or GMR, for short. Especially, in early December when I was there last. I sure was not going to let the cloud filled sky go to … Continue reading "Great Movie Ride HDR at Disney’s Hollywood Studios"
Every Value Resort at Walt Disney World has huge letters spelling out the resort’s name in the bus transportation area. The Pop Century Resort has fun giant POP signs which are impossible to miss as you get off your bus after a day in the parks. As I waited for a bus to get to … Continue reading "Disney Pic of the Week: POP Century"
Water is used extensively throughout the Walt Disney World Resort for landscaping, live shows and special effects. Fire, on the otherhand, is used sparingly. I am sure it is for safety reasons but, when fire is used, it tends to be very dramatic. When you frist see the Sleeping Beauty float in the Disney Festival … Continue reading "Disney Pic of the Week: Fire"
Epcot was the first park I visited at Walt Disney World some 30 years ago. 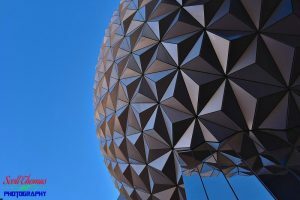 While attractions have come and gone, new countries have sprung up around World Showcase and the trees have gotten taller, Spaceship Earth has endured to become the iconic symbol of Epcot. Spaceship Earth as seen from Epcot’s World Showcase.Nikon D700/28-300VR, … Continue reading "Disney Pic of the Week: Epcot"
Hanging flowers in front of Epcot’s Italy pavilion.Nikon D700/28-300VR, 1/100s, f/16, ISO 200, EV 0, 28mm focal length, polarizer filter. It was a beautiful Autumn day in Epcot’s World Showcase when I took this photo featuring these beautiful flowers in hanging pots in front of the Italy pavilion. I used a small aperture of f/16 … Continue reading "Epcot Flowers"
A Polarizer filter was used to deepen the blue in the sky above Epcot’s Norway pavillion.Nikon D700/28-300VR, 1/60s, f/13, ISO 200, EV +0.3, 56mm Focal Length, polarizer filter. A circular polarizer filter is a favorite of mine. It does two things very well. Removes the haze of a blue sky and create a deep blue … Continue reading "Norway Polarized"
Cloudy days at Walt Disney World can be a disappointment. I mean, we go there for the Florida sunshine, right? On my last trip, I was lucky enough to get a few cloudy days. Lucky? Yes, lucky. For when the sun is above a large cloud bank overhead, it creates a huge softbox. A softbox … Continue reading "Cloudy Sky"